For starters, can you tell us a little about yourself? My name is Jirawong Laopiyaskul and my twin brother is Jirapong Laopiyasakul from Thailand. We’ve been enjoying aquascaping for four years now. In 2011, we stumbled upon a Thai aquaclub website (which no longer existed) while surfing the Internet; after seeing photographs of the aquatic planted tanks on the website, we decided to join the club immediately. What are the challenges starting out? One of the challenges you will find when setting up a new tank would be the layout. It is important not to rush things, but to spend some time planning, which is the key. You need to consider the spaces as well as the type of plants for the layout, too. 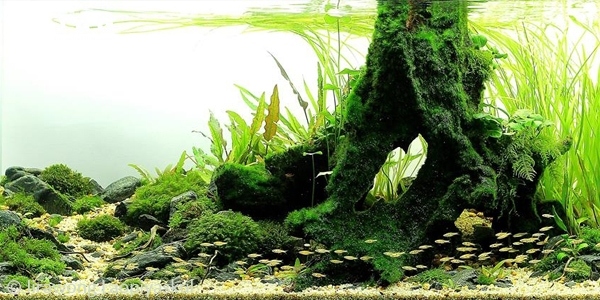 There are different styles of aquascaping out there; what’s your favorite one and why? We agree that we love each type of style, but if we have to choose only one, Iwagumi would be the final answer. 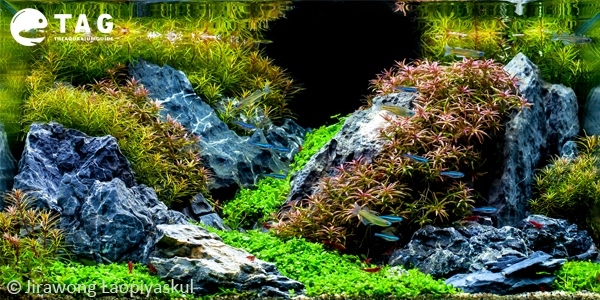 Our first thought when we originally saw Iwagumi works was unique and simple, but full with techniques and imagination. 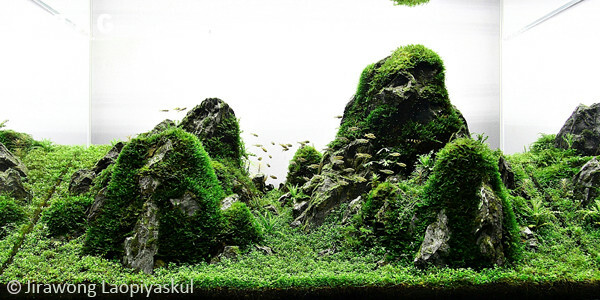 Where do you get your inspiration for your aquascapes? 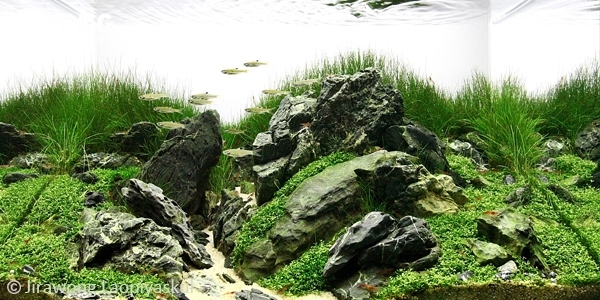 Our inspirations for aquascapes are primarily derived from pictures of nature scenes from the Internet and sometimes inspiration begins with materials we have on hand such as a set of stones or driftwood. What is your favorite species of aquatic plant or fish? Our most favourite species of aquatic plant is Hemianthus callitrichoides ‘Cuba‘. 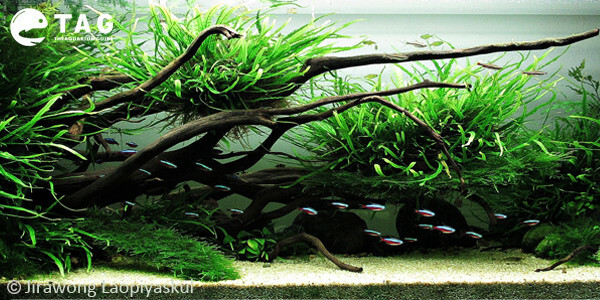 The Green Neon Tetra is the fish we prefer the most. Please describe your current aquarium setup. 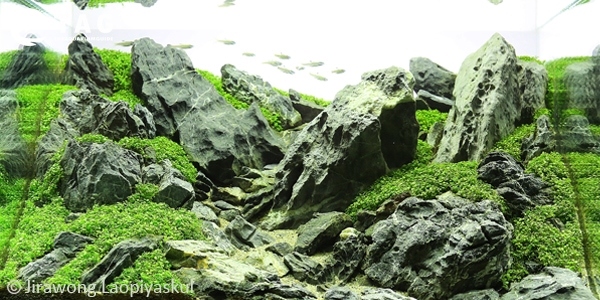 What’s the aquascaping scene like in your country? Is it popular? 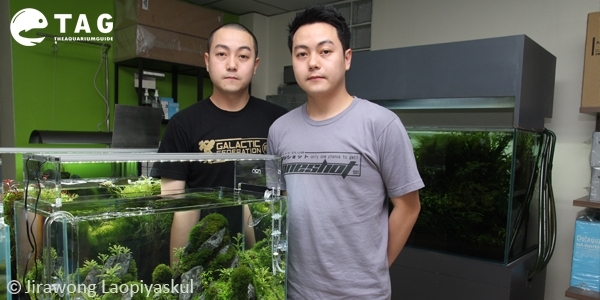 The aquascaping scene in Thailand is growing and becoming more popular now. 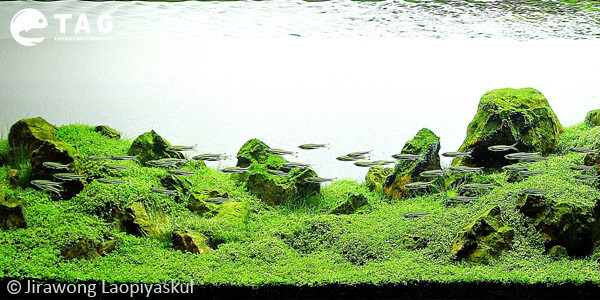 On behalf of the Aquascaper Club of Thailand, we all are trying to promote and educate people about this hobby. Aquac1ub.net is the main website where people can search for almost everything they want to know about aquatic planted tanks. There are at least three large events a year for people to show their Nano tanks and vie for prizes. There is a large variety of products and fish from all over the world available in the JJ market as well as online stores. 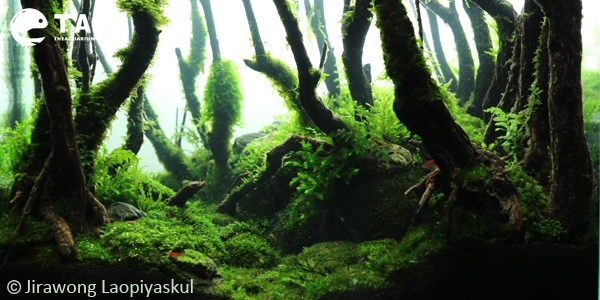 What advice would you give to newcomers who are interested to start aquascaping? There is a multitude of information about aquatic plants and species of fish as well as step-by-step reviews of products on the Internet, which make things a lot easier for beginners nowadays. 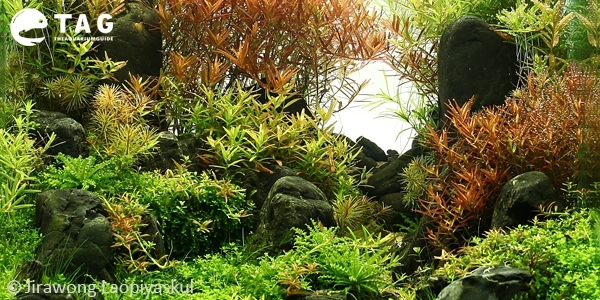 There is no reason to avoid aquascaping because of its unfamiliarity; it is an unbiased hobby. We are on Facebook daily. You can find us here.